1 Optional Practical Training What is Optional Practical Training? Optional Practical Training (OPT) is employment authorization granted by the U.S. Citizenship and Immigration Service (USCIS) that enables a student to gain work experience in his or her field of study and at his or her degree level. Who is eligible for Optional Practical Training? 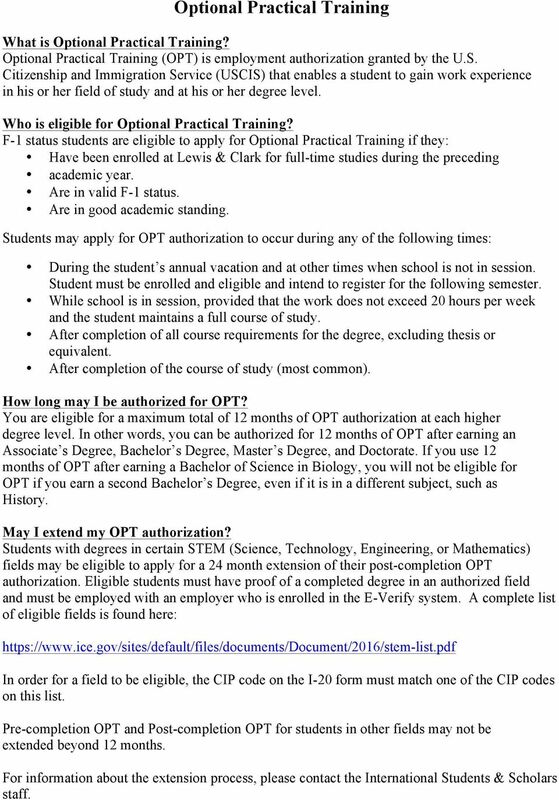 F-1 status students are eligible to apply for Optional Practical Training if they: Have been enrolled at Lewis & Clark for full-time studies during the preceding academic year. Are in valid F-1 status. Are in good academic standing. Students may apply for OPT authorization to occur during any of the following times: During the student s annual vacation and at other times when school is not in session. Student must be enrolled and eligible and intend to register for the following semester. While school is in session, provided that the work does not exceed 20 hours per week and the student maintains a full course of study. After completion of all course requirements for the degree, excluding thesis or equivalent. After completion of the course of study (most common). How long may I be authorized for OPT? You are eligible for a maximum total of 12 months of OPT authorization at each higher degree level. In other words, you can be authorized for 12 months of OPT after earning an Associate s Degree, Bachelor s Degree, Master s Degree, and Doctorate. If you use 12 months of OPT after earning a Bachelor of Science in Biology, you will not be eligible for OPT if you earn a second Bachelor s Degree, even if it is in a different subject, such as History. May I extend my OPT authorization? Students with degrees in certain STEM (Science, Technology, Engineering, or Mathematics) fields may be eligible to apply for a 24 month extension of their post-completion OPT authorization. Eligible students must have proof of a completed degree in an authorized field and must be employed with an employer who is enrolled in the E-Verify system. A complete list of eligible fields is found here: In order for a field to be eligible, the CIP code on the I-20 form must match one of the CIP codes on this list. Pre-completion OPT and Post-completion OPT for students in other fields may not be extended beyond 12 months. For information about the extension process, please contact the International Students & Scholars staff. 2 When do I need to use my post-completion OPT? Post-completion OPT may only be used immediately following completion of a degree program. The latest start date you may request for your post-completion OPT is 60 days following your program completion date. For example, if your program ends May 10th, your requested start date must be on or before July 9th. Your last day of employment authorization must be no more than 14 months after your program completion date. When should I apply? Pre-Completion OPT: We recommend that you apply approximately 90 days before your intended start date. Post-Completion OPT: You may apply as early as 90 days before your program end date/graduation date or as late as the end of your 60 day grace period. Your application must be received by USCIS before the last day of your 60 day grace period. Please Note: o Applications may not be mailed more than 90 days before your program end date or they will be rejected. o You are strongly discouraged from waiting to apply until your grace period as you will lose part of your 12 months of eligibility. It is highly recommended that you submit your application to USCIS before the last day of your program. Where do I apply? You must process your application with a staff member in International Students & Scholars. After you complete the application process, your application materials will be submitted to USCIS for review. Do I need a job offer to apply? You do not need to have a job offer at the time of application. When can I start working? You may not start working until you have received your Employment Authorization Document (EAD) from USCIS, AND the start date on your EAD has arrived. How long will it take to get my EAD? Generally, it takes about 90 days for an OPT application to be approved, though it could take longer at certain times. As you are making your post-graduation plans, be sure to have a plan for how you will cover expenses while you wait for your authorization to begin. Also, be sure that your future employer knows that you may not begin working until you have your card. 3 May I travel internationally while my OPT application is pending? Traveling while your OPT application is pending is complex. The Department of Homeland Security permits students who have applied for OPT, but not yet graduated, to travel abroad and return. However, after graduation, a student s ability to travel abroad and return depends on whether their OPT application has been approved. If the student will return BEFORE the OPT application is approved, they should be able to reenter the U.S. In this instance, they should carry their I-20 showing the recommended OPT as well as their OPT application receipt. If a student will not return until AFTER the OPT application is approved, they cannot reenter the U.S. without a letter of employment. Once an OPT application has been approved, the student will always need a letter of employment to reenter the U.S., along with their EAD card, current I- 20, passport, and visa. What are the employment requirements while I am on OPT? Pre-Completion OPT: You must be employed in a position that is directly related to your field of study. The number of hours of work per week may not exceed 20 hours unless it is OPT during a break period or you are a graduate student who has completed all coursework except the thesis or dissertation. 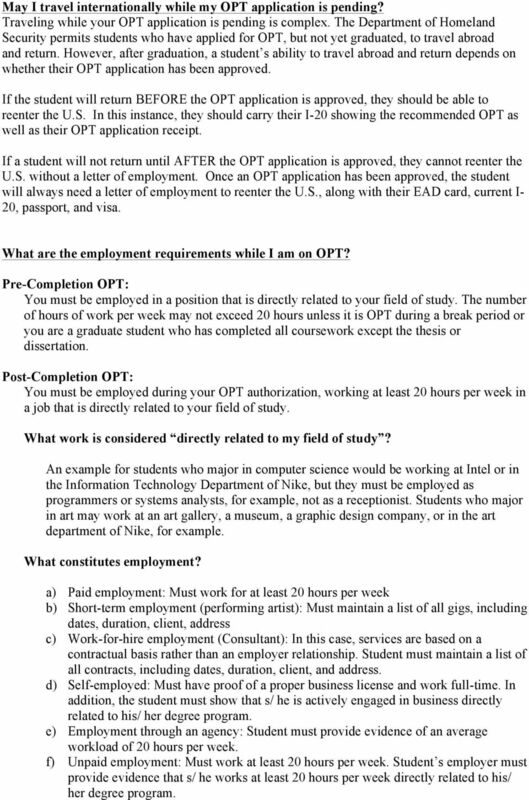 Post-Completion OPT: You must be employed during your OPT authorization, working at least 20 hours per week in a job that is directly related to your field of study. What work is considered directly related to my field of study? An example for students who major in computer science would be working at Intel or in the Information Technology Department of Nike, but they must be employed as programmers or systems analysts, for example, not as a receptionist. Students who major in art may work at an art gallery, a museum, a graphic design company, or in the art department of Nike, for example. What constitutes employment? a) Paid employment: Must work for at least 20 hours per week b) Short-term employment (performing artist): Must maintain a list of all gigs, including dates, duration, client, address c) Work-for-hire employment (Consultant): In this case, services are based on a contractual basis rather than an employer relationship. Student must maintain a list of all contracts, including dates, duration, client, and address. d) Self-employed: Must have proof of a proper business license and work full-time. In addition, the student must show that s/ he is actively engaged in business directly related to his/ her degree program. e) Employment through an agency: Student must provide evidence of an average workload of 20 hours per week. f) Unpaid employment: Must work at least 20 hours per week. Student s employer must provide evidence that s/ he works at least 20 hours per week directly related to his/ her degree program. 4 How long can a student on post-completion OPT be unemployed? Students on post-completion OPT may be unemployed for a cumulative maximum of 90 calendar days during the 12 months of authorization. What counts toward the 90 days of unemployment? Every day you are without a job counts towards the 90 days with one exception. If you are moving from one job to another and the gap is 10 days or shorter, then this period will not be calculated towards the time spent unemployed. What are the consequences of exceeding the period of unemployment? If you have not found employment while on post-completion OPT you will be considered out of status and your record will be terminated by SEVP (Student and Exchange Visitor Program), unless you have taken one of the following actions: a) Applied for a new program of study to continue your education in the United States by a change of level or transferring to another school b) Departed the United States c) Taken action to change to a new authorized status in the United States (e.g. H1 or Permanent Resident) How do I document that I am employed? You must notify the ISS office of any changes to your employment within 10 days of the change. You should the following information to ISS: 1. Name and address of your employer 2. Job title 3. Contact information for your direct supervisor: Name, , phone number 4. Start date of the employment (and end date, if applicable) 5. Number of hours per week (approximately) that you are working 6. One to two sentences explaining how the employment is related to your major and course work. Upon departure from a job, you must notify the ISS that you are no longer employed in that position. We recommend maintaining evidence for each job in your personal files. You should maintain a list of all positions held. The list should include: position title, position description, and duration, as well as contact information of the employer or supervisor. If your job description does not clearly relate to degree program, you should obtain a letter from the employer or supervisor explaining how your degree is related to the position. May I travel internationally while I am on OPT? You may travel outside the United States while you are on OPT. In order to re-enter, you must have all of the following: 1. Form I-20 signed within the last six months 2. Passport valid at least six months into the future 3. Valid F-1 visa* 4. Employment Authorization Document 5. 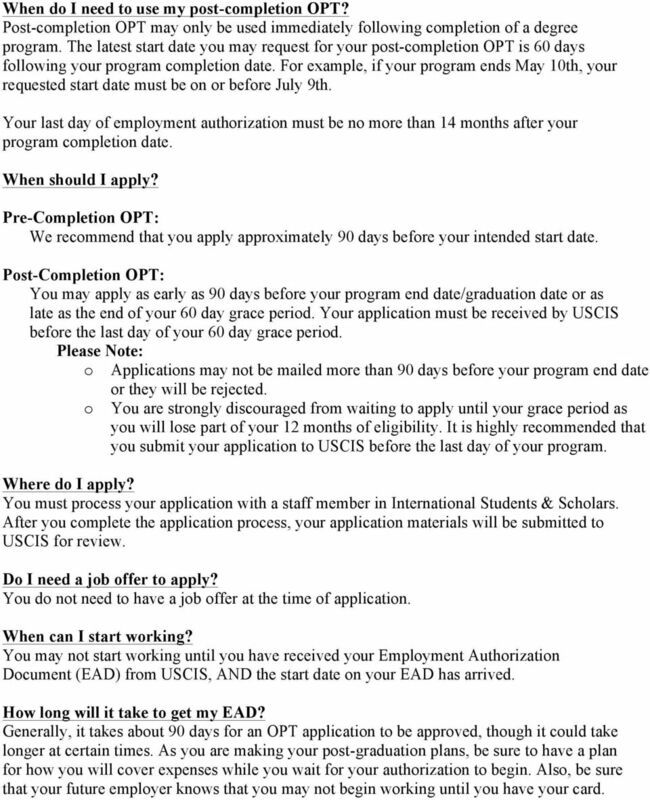 Letter from your current or future employer confirming that you have OPT-eligible employment in the U.S. You will not be allowed to re-enter the United States if you do not have proof of employment. *If your F-1 visa has expired you will need to apply for a new F-1 visa before returning to the United States. Please talk with the ISS staff before you make your travel plans as applying for a new F-1 visa during OPT can be extremely difficult. 5 May I study while on post-completion OPT? You may study on an informal basis (not pursuing a degree or other academic objective). If you begin a new degree program, your I-20 will need to be updated to reflect that change and the remainder of your OPT will automatically be canceled. Do I need to remain in contact with the International Students and Scholars Office while I am on post-completion OPT? Yes! During the OPT authorization period, you are still in F-1 status. You must report the following to our office within 10 days of a change: 1. Change in your physical address or your address 2. Change in your employment status or your employer 3. Change of immigration status (e.g. change to H1 or to permanent residency) 4. 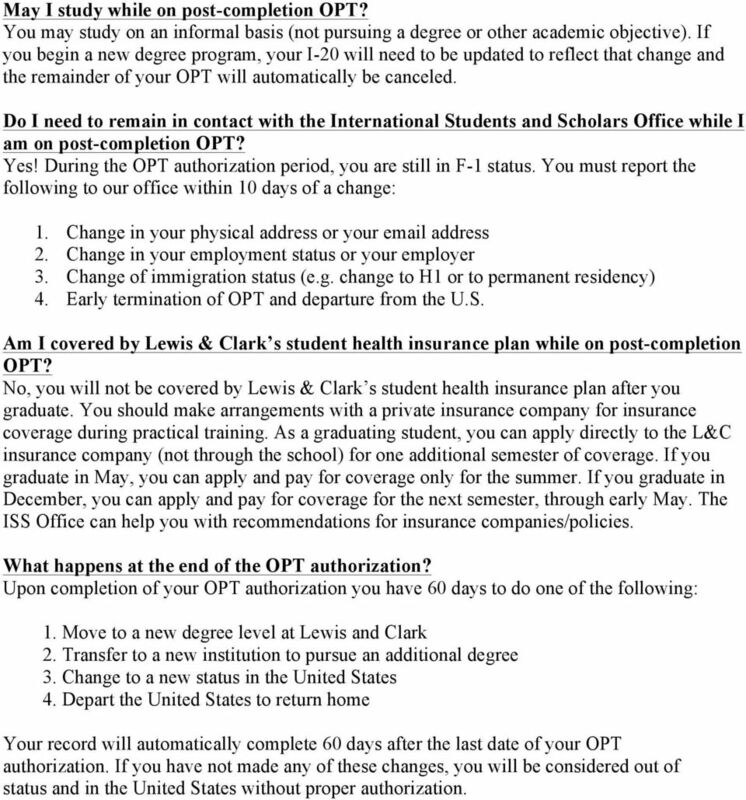 Early termination of OPT and departure from the U.S. Am I covered by Lewis & Clark s student health insurance plan while on post-completion OPT? No, you will not be covered by Lewis & Clark s student health insurance plan after you graduate. You should make arrangements with a private insurance company for insurance coverage during practical training. As a graduating student, you can apply directly to the L&C insurance company (not through the school) for one additional semester of coverage. If you graduate in May, you can apply and pay for coverage only for the summer. If you graduate in December, you can apply and pay for coverage for the next semester, through early May. The ISS Office can help you with recommendations for insurance companies/policies. What happens at the end of the OPT authorization? Upon completion of your OPT authorization you have 60 days to do one of the following: 1. Move to a new degree level at Lewis and Clark 2. Transfer to a new institution to pursue an additional degree 3. Change to a new status in the United States 4. Depart the United States to return home Your record will automatically complete 60 days after the last date of your OPT authorization. If you have not made any of these changes, you will be considered out of status and in the United States without proper authorization.